A bit of news made the rounds yesterday, announcing two new unlimited plans from T-Mobile: The Even More Unlimited plan for $80/month (contract) and the Even More Plus Unlimited plan for $60/month (no contract). 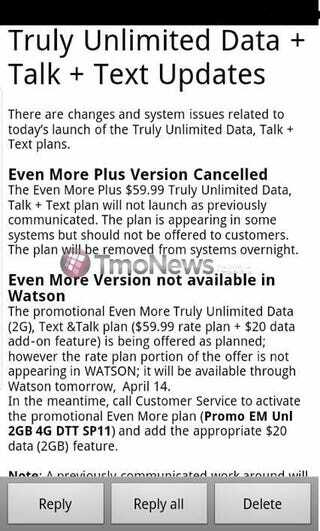 Then the official press release came out today making no mention of the Even More Plus plan. Now, Tmo News has posted an internal document which basically says the Even More Plus plan was killed off at the last minute and employees should adjust accordingly.